Does your child have trouble with their speech? Does your child say less than the average number of words or phrases for their age level? Is it difficult to understand your child’s speech? Does your child receive speech services from your school? Is your child unable to communicate their wants and needs to you? Does your child have difficulty with social or play interactions? Find out what factors affect language development and what you can do now to help! 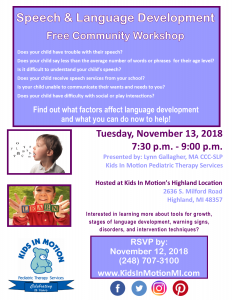 Interested in learning more about tools for growth, stages of language development, warning signs, disorders, and intervention techniques?